This plan demonstrates how a partnership can have a positive impact on a new business. It demonstrates how two individuals can carve a niche in the specialty foods market by offering gourmet foods to upscale restaurants and fine hotels. This plan is fictional and has not been used to gain funding from a bank or other lending institution. Commercial Foods, Inc. will be a distributor of specialty food service products to hotels and upscale restaurants in the geographical area in a 50 mile radius of Knoxville. Richard Roberts will direct the sales effort and John Williams will manage the warehouse operation and the office. One delivery truck will be used initially with a second truck added in the third year. We expect to begin operation of the business within 30 days after securing the requested financing. Richard Roberts is a native of Memphis, Tennessee. He is a graduate of Memphis State University with a Bachelor's degree from the School of Business. After graduation, he worked for a major manufacturer of specialty food service products as a detail sales person for five years and for the past three years, he has served as a product sales manager for this firm. John Williams is a native of Nashville, Tennessee. He holds a B.S. Degree in Food Technology from the University of Tennessee. His career includes five years as a product development chemist in gourmet food products and five years as operations manager for a food service distributor. Both men are healthy and energetic. Their backgrounds complement each other which will ensure the success of Commercial Foods, Inc. They will set policies together and personnel decisions will be made jointly. Initial salaries for the owners will be $1,000 per month for the first few years. The spouses of both principals are successful in the business world and earn enough to support the families. They have engaged the services of Foster Jones, CPA, and William Hale, Attorney to assist them in an advisory capacity. The firm will employ one delivery truck driver at a wage of $8.00 per hour. One office worker will be employed at $7.50 per hour. One part-time employee will be used in the office at $5.00 per hour. The driver will load and unload his own trucks. Mr. Williams will assist in the warehouse operation as needed to assist one stock person at $7.00 per hour. An additional delivery truck and driver will be added the third year. The firm will lease a 20,000 square foot building at 3003 Avondale Ave., in Knoxville, which contains warehouse and office areas equipped with two-door truck docks. The annual rental is $9,000. The building was previously used as a food service warehouse and very little modification to the building will be required. The firm will offer specialty food service products such as soup bases, dessert mixes, sauce bases, pastry mixes, spices, and flavors, normally used by upscale restaurants and nice hotels. We are going after a niche in the market with high quality gourmet products. There is much less competition in this market than in standard run of the mill food service products. Through their work experiences, the principals have contacts with supply sources and with local chefs. We know from our market survey that there are over 200 hotels and upscale restaurants in the area we plan to serve. Customers will be attracted by a direct sales approach. We will offer samples of our products and product application data on use of our products in the finished prepared foods. We will cultivate the chefs in these establishments. The technical background of John Williams will be especially useful here. We find that we will be only distributor in the area offering a full line of gourmet food service products. Other foodservice distributors offer only a few such items in conjunction with their standard product line. Our survey shows that many of the chefs are ordering products from Atlanta and Memphis because of lack of adequate local supply. Commercial Foods, Inc. will be established as a foodservice distributor of specialty food in Knoxville. The principals, with excellent experience in the industry are seeking a $75,000 loan to establish the business. The principals are investing $25,000 as equity capital. The business will be set up as an "S" Corporation with each principal owning 50% of the common stock in the corporation. 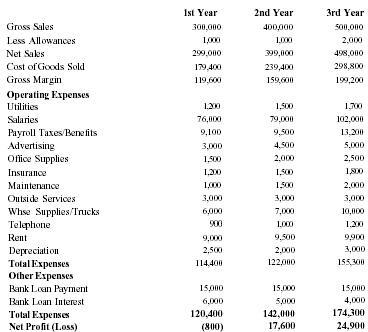 Attached is a three year pro forma income statement we believe to be conservative. Also attached are personal financial statements of the principals and a projected cash flow statement for the first year.